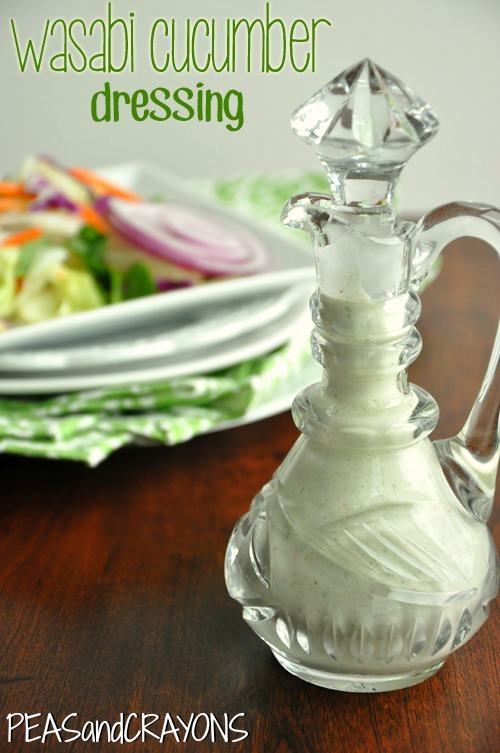 Wasabi Cucumber Ranch Dressing: Zesty wasabi and cool cucumbers are the perfect pairing in this delicious homemade salad dressing. It’s quick and easy too! It started with my 6am banana routine and now includes a balanced sleep-breakfast of fruit and cereal. At least I think it has. I’ve gotten in the habit of keeping a box of cinnamon oat squares on my nightstand and have been waking up to cereal-shaped surprises in my bed. You haven’t truly lived until you’ve found a quaker oat square stuck to your leg in the morning. Actually, I’m no stranger to sleep shenanigans. As a kiddo I was infamous for prancing around in my footed pajamas in a slightly comatose state. I’d grab a glass of water, a handful of ice cubes to munch on, or just simply trot around the house until my pillow lured me back in. Nothing major. Though sometimes I’d wake up in the closet. I still haven’t figured that one out. This post actually has nothing to do with sleeping. Or snacking. But it does have everything to do with salads! Let’s OD on them before fall kicks in full force and takes away the bulk of our summer produce. Like cucumbers… Ohmygosh I’m going to miss cucumbers!!! Of course since it’s the end of summer you’ve probably been shoveling salads into your face for the past few months, eh? Feeling a bit bored? Let’s change that with a new dressing! Re-vamp a pile of veggies and greens by introducing a new flavor combination to the mix! This dressing is creamy, refreshing, and zesty thanks to the combination of crisp cucumber, cool greek yogurt, and, of course, wasabi! I keep wasabi powder on hand since it’s a little more authentic and has a much longer shelf-life. It’s basically just dried wasabi that needs to be reconstituted with water. Mixing the powder with cold water forms a paste; easy peasy! If you already have wasabi paste handy, just adjust the amount added to the dressing per your tastebuds since different brands will vary in intensity. Either way, you’re covered and ready for one baller dressing! Serve over a gorgeous green salad piled high with your favorite vegetables and lots. of. cucumber. If you’re looking for a protein boost, add raw or roasted chickpeas or even seared tuna to the salad too! Zesty wasabi and cool cucumbers are the perfect pairing in this delicious homemade wasabi cucumber salad dressing. It's quick and easy too! Get Blending! After chopping your veggies, add all the above ingredients to a food processor or blender and pulse until smooth. The dressing will thicken after spending a little time in the fridge and you can also add 1-2 tablespoons of greek yogurt to thicken immediately. I like my dressings a bit more runny since they cover more ground (aka veggies!) that way. Enjoy! 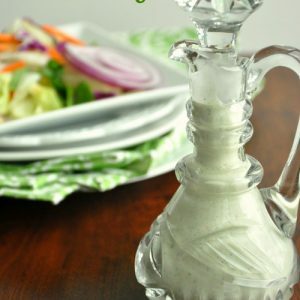 Recipe yields 1 cup of delicious dressing! I keep wasabi powder on hand since it has a longer shelf-life than the paste. I can keep it handy alongside my spices and mix up as much or as little wasabi paste as I need this way and LOVE it! If you're running to the store, I suggest hunting this down. If you already have wasabi paste handy, just adjust the amount added to the dressing per your tastebuds since different brands will vary in intensity. Start small and add extra to taste. so… what else can you do with wasabi?! Spread it on homemade sushi or whip it into fluffy wasabi mashed potatoes — YUM! 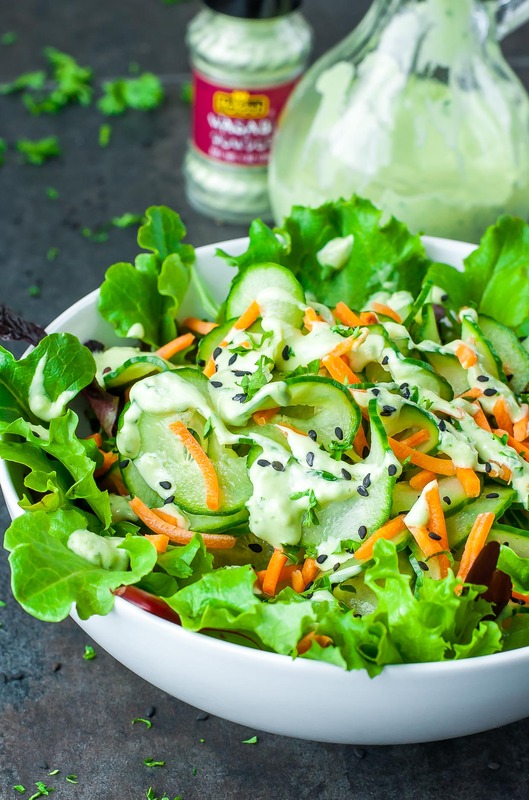 You can even channel the flavor of this dressing and take it a step further with an AVOCADO-based Wasabi Cucumber Dressing. It’s a fabulous combo of zesty and refreshing, and vegan too! So where do you think I went wrong here? Is it possible that I got a bad batch of Wasabi powder? 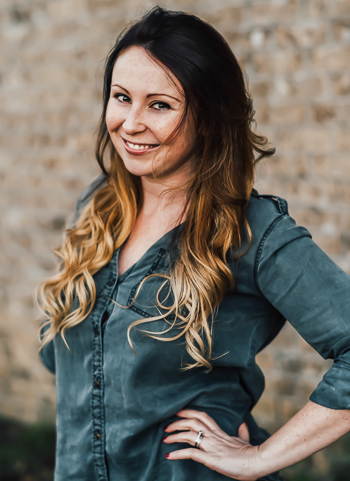 Hi Karen! I’ll help you investigate! You mentioned the cucumber was okay but my first question would be what kind of cucumber did you use and did you use the skin? YUM! I love the sound of this. I love when dressings have a good kick to them! I want this on a pita with a salmon burger and a glass of white. thanks. Yum! Can’t wait to try it! I’m a wasabi addict lately. You better be eating all the spicy foods!!! I’m so excited to try this. I found a place in town that has REAL wasabi (not the harseradish American stuff). YUM! we love foods with a kick and this looks cool, refreshing, and spicy!! and you could really dip ANYTHING in it!! yum!